My daughter Anne and I developed this variation on monster cookies because her son required a gluten-free, dairy-free, and soy-free diet as a toddler and pre-schooler. Gluten isn’t an issue in monster cookie recipes since they use use oats, a grain he could tolerate, instead of flour. 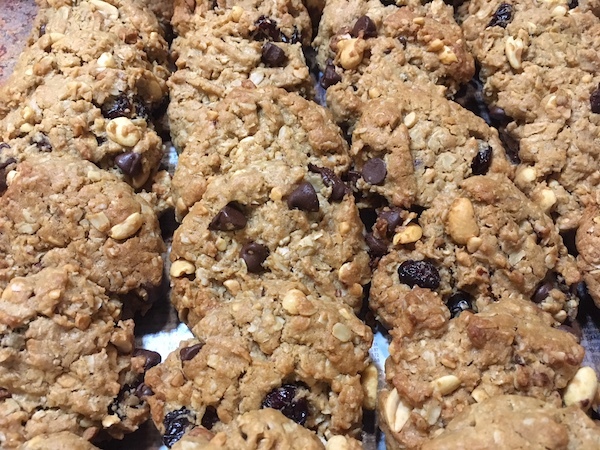 To make the cookies dairy-free, we substituted lard for the butter called for in the recipe we adapted, replaced the M & M’s with peanuts and dried fruit (raisins or Craisins), and used the Enjoy Life brand chocolate chips. (If soy isn’t an issue at your house, Costco’s Kirkland chocolate chips are also a good dairy-free alternative.) Now, on to the recipe! 4 1/2 cups rolled, not quick, oats not quick oats! Preheat oven to 350°. Putt baking stones in the oven to heat them. Cream peanut butter, lard, sugar, and eggs until creamy and fluffy. Add remaining ingredients in order, mixing well after each addition. Scoop dough with a teaspoon or soup spoon, depending on how big you like your cookies. Shape them into balls and place them on heated baking stones. Press them slightly flat with a fork. Bake for 12 to 15 minutes to desired doneness. *For best results use natural peanut butter (Skippy or Jiff) that doesn’t need to be stirred after the jar is opened. Otherwise the cookies will not hold together.